Katsuma Unleashed is one of those games that I got on a whim. When I’m at GameStop I always like looking at the games that are 5 dollars or less. It is especially rare to see a 3DS game go for such a cheap price so I knew that I had to get it. I don’t think I even knew the genre at the time and only learned that it was a classic side scroller a little later on. It’s a fun game but it’s pretty clear why it is so cheap. The game is incredibly short so you can power through it with ease. Still, it’s a fun game and that’s what counts. The plot of the game is that all of the happy monsters have been captured by a nefarious scientist. I don’t think this guy is an animal but it’s hard to say for sure. He doesn’t exactly seem human either as his neck is too long and his eyes are too high up. Fortunately for the animal kingdom, the Doctor was unable to catch the main character. It’s time to liberate the animals and show the Doctor that when you take on one monster, you take them all on. As I mentioned, the core gameplay is basically like Mario or Kirby. You traverse through the levels, taking on enemies and obstacles along the way. At the end of each level is a capsule that you step on which unlocks the next level. That bit is pretty similar to Sonic . Of course, every side scroller has something to keep it unique and this one is no exception. You gain a new power after each world until you have all 5. You gain the ability to make an indestructible barrier which can endure several hits. It is by far the most useful ability. You also gain the ability to fly for long periods of time which is best for trying to speed blitz through the levels. The worst ability is your super punch. You’ll never end up using it except when the game forces you to do so. There are also your eye lasers, those are fairly fun and useful. Your final ability is that you can slow down time which is usually great, but there just isn’t much reason to use it here. As all of the bosses go through their normal patterns where you have to wait for an opening, using time stop would just slow you down. This game is just one of those interesting cases where your base moves are so good that there is rarely a need to use your powers except flight and the barrier. Why use a punch or energy blast when it’s quicker to just spin and win? The main character’s spin move is incredibly useful and never gets inefficient to use. I mainly use flight so I can just keep running and jumping without fear. If I start plummeting just activate flight as a save. The barrier did come in handy against the final boss which was actually a fairly tough fight. So the levels are a lot of fun. They are made quite well and you do need a level of skill to get past all of them. The game is fairly easy so I mean that quite lightly. You also have unlimited lives and many checkpoints so you will no doubt beat the game at some point. There’s no real pressure like this which is nice. While easy, that doesn’t make the levels any less enjoyable. I only have one real problem with the game. It’s not the story. Barebones as it is, the story was basically nonexistent, but at least it wasn’t bad. What hurts the game a little is how short it is. Each level is typically 2-3 minutes with a small handful of 5 minute levels in there. There are 24 levels so you can do the math. This game isn’t very long at all. It does it’s best to add replay value though as there are a bunch of collectibles to nab. If you grab them all then you get the true ending. After all, one of the lead scientists is still captured in the normal ending so you can tell that the quest must go on. It wouldn’t take too long to get to the secret ending but it’s certainly better than nothing. I wasn’t quite a big enough fan to go for it myself, but it’s nice to know that the option is there. The graphics are pretty nice and a little better than I had expected but this is a 3DS game so I suppose that makes sense. The levels are very bright and colorful and the character models are on point. At the very least I don’t think they skimped out on this part of the budget. The music is less impressive. It’s not bad, but it isn’t memorable either so I think you will forget it rather quickly. There also aren’t any real cutscenes and not even text bubbles pop up. That would have been fun, but I suppose you can’t win them all. The bosses are all unique which is impressive as some big games are quick to reuse them to save budget. (Sonic Forces) The boss levels are fairly intuitive so you will quickly find out what to do while still feeling like you picked up on the weakness yourself. Just another reason why this game is so solid. The final boss came very close to defeating me which was quite impressive but I got the barrier up just in time. Overall, Katsuma Unleashed is probably the definition of a solid platformer. It is very easy to pick up and play with the gameplay being polished enough for you to think that it’s an AAA title. In pure 2D gameplay I would even rate it over Sonic. Of course, the budget limitations do begin to show in other areas like the duration and lack of a story. If you are playing purely for the story then you should probably skip this one. If like me you are really playing for the gameplay then you must buy this one. It’s only a few dollars which is a bargain and also offsets the negative of being a short game. 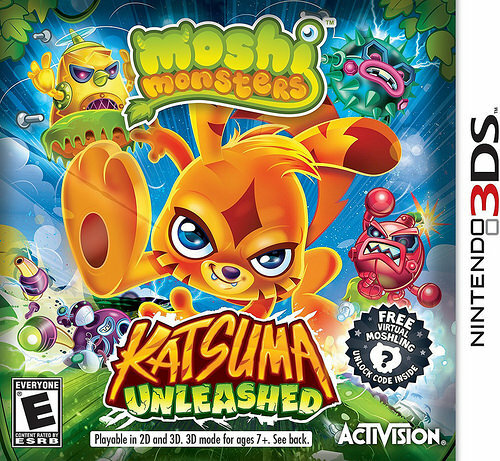 This entry was posted in 7 Star Games, Game Reviews, Games, Reviews and tagged 2D, 3DS, Game Review, Katsuma Unleashed, Moshi Monsters, Nintendo, Review, Sidescroller, Video Game Review by dreager1. Bookmark the permalink.